Take on the role of a MMA manager in the modern fight business. 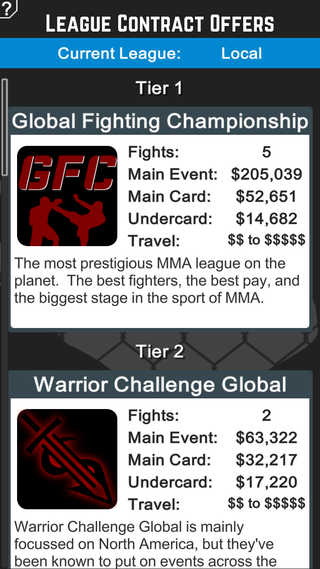 Manage your gym and build your fight team from the local scene to the heights of managing world champions in the top promotions. This is your fight team. Recruit fighters from multiple weight classes and hire coaches to train them. 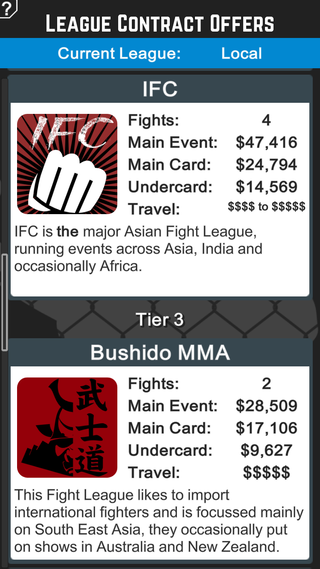 Negotiate with leagues, book fights, and guide your fighters up the ranks to win titles. 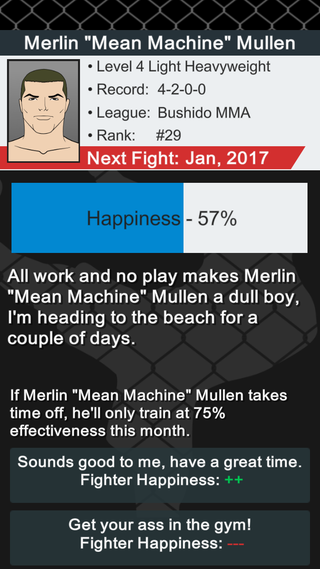 An open-ended game in a simulated MMA world with 10 different fight promotions and at least 940 AI fighters. Wide range of procedurally generated fighters with differing appearances, skills, stats, martial arts backgrounds, records and personalities. Fighter appearances can vary in hair styles, colours, tattoos, skin tone, facial hair and cauliflower ears. 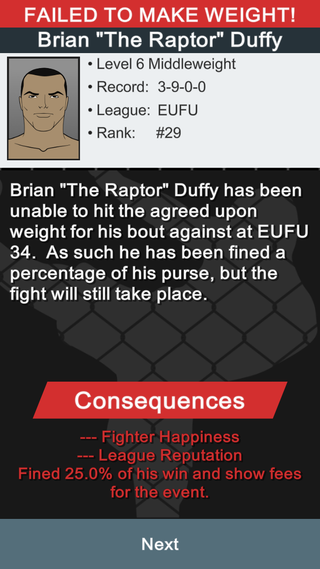 AI Fighters will age out, fight each other and move up and down the rankings. Fully Simulated player fighters and personalities including greed, happiness, bad habits and career goals. 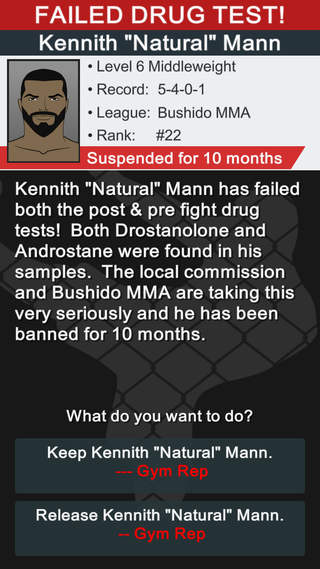 Manage your fighters’ careers, keep them happy but remember you can always get rid of them. Complex fight simulations with a huge number of possible combinations of action that can make up each fight. Corner fighters and influence key moments in the fight. Different martial arts styles affect what techniques fighters can use. Fighters can learn new styles from their coaches. Deal with issues like missing weight, injuries, and PEDs. Upgrade and equip your gym with the best equipment to compliment your coaches. It's a K.O Really good game and worth the money. Soon as you understand how to play it you will love it. Will keep you coming back for more. Hours of fun. Definetly recommend getting this. It is deep enough to allow you to feel like you are running things without ever being too overwhelming and will keep you entertained for many an hour. A must for any MMA fan. A gem. 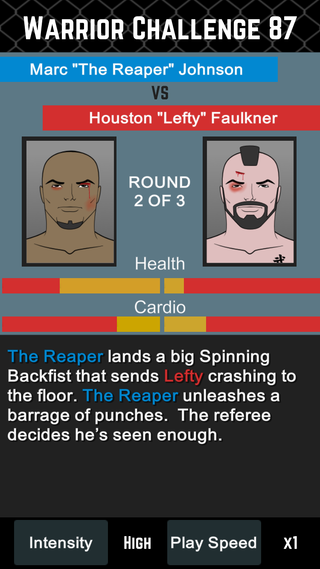 If you like MMA, and thinking man games (this is not an action game). You will love this! The developer has already launched an impressive campaign of updates to the game which to me shows the love that is going into this project. One of the best simulation games on any platform The best android simulation management game I have played on android. If you spend your days flexing your fists and practising your fighting footwork, this is the perfect game to liven up the bus stop. Tons of fun I'm digging it a whole bunch, it's really cool. Very user friendly, doesn't take lots of time to master. It also simulates lots of real MMA experiences like PEDs, missing weight, etc. This is an awesome game. I have been hooked ever since downloading it. Need more sims like this for crying out loud, the way these games pass time is amazing! You must go on. You can’t go on. You’ll go on. All for 10%. Very Good Not a massive MMA fan, but love strategy / management games and really enjoying this. Deserves 5 stars. Loving it best manager game on phone. Must have for sim fans. Outrageous game, super fun and addictive. 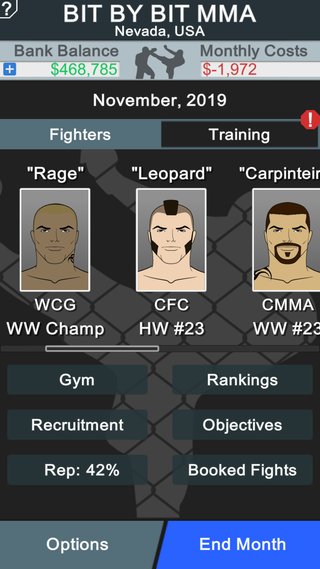 MMA Manager is designed for fans who are looking for an addictive strategy game to play out their perfect gym. Love it I'm a sucker for these text based sports sims. This is one of the best mobile ones I've played. Great even if you aren't an MMA fan! 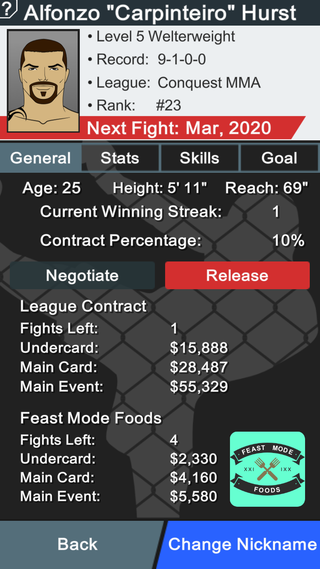 MMA Manager is a great management sim to pass time or any train journey or whenever you get a spare moment. All Kinds of Fun!! I played this game and it's really fun, the strategy isn't too hard to deal with and that makes the game more entertaining!